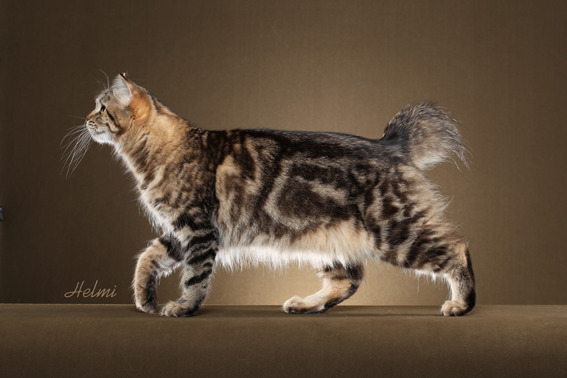 The American Bobtail cats have a loving disposition. The breed is very intelligent - perhaps as a result of surviving skills of the early breeding stock in nature. They can open doors by standing on their back legs to reach the door knob, and cages won't keep this escape artist, if the doors are easy to open. Thank you, Helmi Flick, for allowing me to use this beautiful photo of MagicBob Yukon Red. This breed is from moderately to extremely interactive - maybe we detect a trace of the Siamese cat there? They are not very loud, but like to greet and discuss with their purrsons with lovely trills and chirps. The American Bobtail loves your whole family, not just one person. And it wants to be with your family - it thrives with company and does not want to be alone for long stretches of time. It will be ok when it is a metter of a few hours, though, but is happier with company. Also this cat doesn't hide under the bed when visitors come. They are with you to welcome them into your home. Because of this friendly nature, it is wisest to keep you American Bobtail as an indoor cat. He might be stolen when he goes to make acquaintance with strangers. Not to mention the dangers caused by cars and wild animals. Free-roaming cats may also catch diseases from other cats. The American bobtails are playful and you see them often walking about, carrying their favorite toy in their mouth. They have a strong hunting instinct and have a liking to shiny objects, so you might want to keep your jewelry locked away. Give your bobtail scratching posts as this breed loves to perch high. Thank you, Helmi Flick, for letting me use your beautiful photograph of MagicBob Itsy Bitsy for this article. The American bobtail get along well with children and other pets. Thought of course care should be taken that the children handle the cat in a good manner. This cat learns easily to walk on a leash and loves long walks with their purrson. They play fetch and hide and seek. Because of their active nature try to find a few minutes every day to play with your American Bobtail. Its adaptable nature makes this cat is easy to travel with. The story goes that the truck drivers like to travel with American Bobtails. The coat does not need much care - an occasional brushing is enough. There is some shedding year round, more in spring and autumn. Brushing does decrease the amount of hair on your furniture - loose hair or hair balls gagged out by the cat after they have washed themselves. So regular brushing means less trouble for you to clean the house. Not to mention how much your American Bobtail likes being brushed. The male American Bobtails are protective of their offspring, and behave in a gentlemanly manner towards females and other pets. The females are not jealous of their kittens and let people handle them easily. The American Bobtail's life expectancy is 11 to 15 years. It is quite a healthy breed, as it is not over-bred. 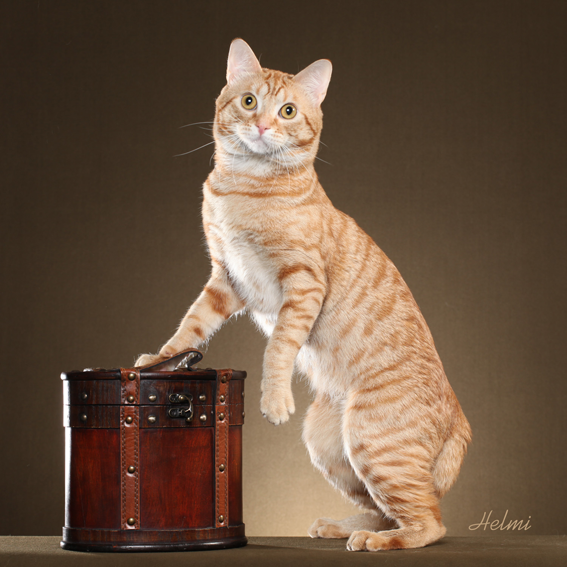 The photograph of MagicBob Yukon Red is copyrighted by the professional cat photographer Helmi Flick. Do not use without Helmi's permission. You'll find her website here.